This is a great way to give the classic recipe a twist! It is low-carb friendly, festive, and perfect for a weekend brunch or a light winter meal. 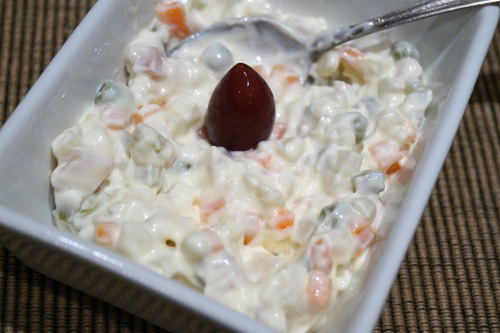 This salad is a tasty treat for any occasion and is elegant and filling. It serves well as a side dish or entree and is a great choice if you want to prepare it for a special dinner ahead of time. You can also serve as a main-dish salad. The flavors and colors come together in this nutritious, well balanced, and scrumptious salad which everyone enjoys. Boil the carrots and cauliflower. Leave aside to cool, chop and place in a salad bowl. Rinse the peas with water, drain and add to the mix. Squeeze the pickles, chop, and put in the bowl. Chop the hard boiled eggs, dice the ham, and add to the mix. Use a separate bowl to mix the mayonnaise, yogurt, and lemon juice. Mix well until you have a creamy, even sauce. Add to the salad mix, season with salt to taste, and combine well. If the pickles are too salty, you can skip salt. Put in the fridge for 1 - 2 hours or overnight and serve. Make scoops to arrange beautifully.